The ladies non-Quickset DateJust shares the same provenance and features as the lady DateJust, but it requires a little more effort to set the time. This video will show you how to set the date and time and wind the watch such that it keeps its’ water toughness. 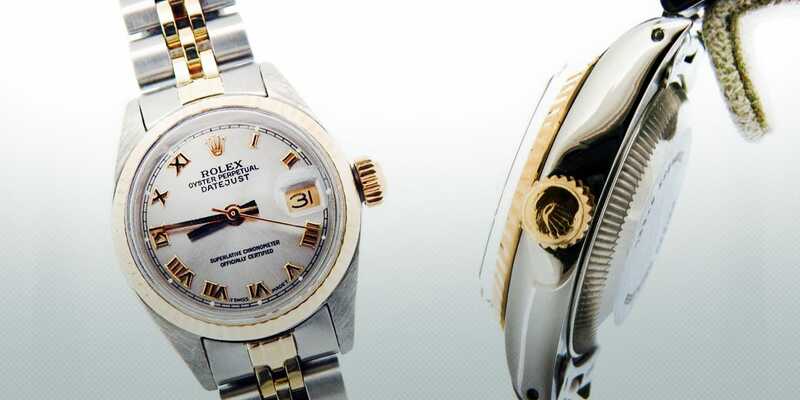 This is a ladies two-tone DateJust Non-Quickset. The reference number is 6917. We’re going to show you how to set the time, set the date, and wind your watch. The first position that it is in is the locked position; its you’re wearing position. Notice that it is all the way screwed in. Now what we are going to want to do is wind the watch so we can fully charge the movement. The reason for this is if the watch has not been worn for maybe a day-and-a-half, or if you just received it as the watch was in a box. The watch will need to be manually wound in order to fully charge the movement so that it will run properly. First what we are going to do is gently unscrew the crown in a counterclockwise position to where it unthreads. Now, in a clockwise motion, we’re going to wind the watch approximately 20-40 full turns in a clockwise motion. Okay, now, we’re going to want to set the date first. Now, this model does not have the Quickset date feature that allows you to quickly advance the date at the crown position. The way to set the date is by pulling the crown gently all the way out to its’ last position in either a counterclockwise or clockwise motion. We’re going to take the hour hand pas the 12 position two-times for every 24 hours. And we’re going to go to the 26. Notice that this first turn-around is only for the 12 hours. And now, getting closer to midnight it turns to 26, and the time right now is actually 2:25 in the afternoon -so we are going to take it to 2:25. And once we are there, we’re going to gently push in the crown all the way and turn up. Now it is in its’ wearing position and you are ready to enjoy your watch.